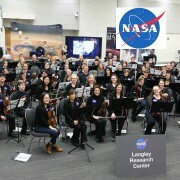 Members of the Lafayette HS Orchestra perform as part of the Global Orchestra at NASA. Orchestra players throughout the world joined together during Earth Hour on Saturday to perform Holst’s âThe Planetsâ, connected together by the symphony and conductor of the Sydney Orchestra in Australia, being streamed live around the world. AEP choir will not meet today. After-School SOL tutoring for the Writing SOL test will be held at 2:25 in room 311 every Tuesday and Thursday. After-School SOL tutoring for the Algebra 1 SOL Test will be held at 2:25 in room 409 every Tuesday. Please see Mrs. Colorado in room 600 if you have any questions. Attention Juniors – today there will be an informational meeting for the Junior One Act after school in the Black Box Theatre in room 623. This meeting is open to all Juniors that are interested in being part of the One Act Play. No experience necessary. Attention all Lit Mag members and students interested in joining – we will be meeting today and Wednesday, April 1st at 2:30 in room 102 to select work and create spreads for the 2015 edition of Imprint. Attention Seniors – this is your last chance to be in a school play before you graduate. Auditions for the Senior Class Act One play will be on Thursday, April 2nd immediately after school in the Black Box Theatre room 623. No experience necessary. If you have any questions please see your Senior Director Naveen Hrishikesh or Mrs. McCorry in room 623. Congratulations to our Girls for winning the Con Madden Relays championship against the Triple A division; our Boys took 2nd place. With combined scores between the girls and boys LHS took 1st place. The window for course requests closes on Saturday, April 4th. All students are expected to request 8 classes for next year by April 4th. Attention all Lit Mag members and students interested in joining – we will be meeting today, tomorrow and Wednesday April 1st at 2:30 in room 102 to select work and create spreads for the 2015 edition of Imprint. There will be a mandatory boys’ basketball meeting Tuesday, March 31st at 2:30 in room 112. Only players that played last year should attend. Please contact Coach Woollum if you cannot attend. Students interested in a career in Automotive/Transportation. Wyotech will be here on Thursday, April 2nd from 10:00 â 11:00am. Students interested please sign up in the green book located on the door of room 622. Seniors interested or planning to attend Thomas Nelson – Thomas Nelson’s open house will be held on Thursday, April 9th at the Historic Triangle from 1:00 â 4:00pm. Please visit the LHS homepage or TNCC.edu to register. Do you want to be a Lafayette cheerleader? We will be offering our annual cheerleading open gym and skills building clinic. There will be an informational meeting held in the upper commons on Monday, April 13th at 4:30pm. The clinic is open to all girls and boys interested in building cheer skills. Seniors – Workforce Development and Continuing Education along with the Youth Career CafÃ© will be here Tuesday, April 14th from 10:00 â 11:00am to present career workforce and continuing education opportunities. Juniors are welcome to attend. To sign up or for more information, please see Ms. Adkins, Career Coach in room 622. If you like to eatâ¦if you like nutritious foodâ¦if you like to cook, than come join the Cooking Club. It starts Wednesday, April 15th at 2:30 in room 417. Please sign-up with Mrs. Carter in room 417 or 101 or with Mrs. Wynne in the cafeteria. Tackle MS – come to the Orange out Football Game on Friday, May 1st at 6:30pm at the Warhill Sports Complex to bring awareness to Multiple Sclerosis. Spread the word, sign up during lunches on Wednesday, April 1st or Wednesday, April 15th to play in the game. Attention Juniors Tuesday, March 31st there will be an informational meeting for the Junior One Act after school in the Black Box Theatre in room 623. This meeting is open to all Juniors that are interested in being part of the One Act Play. No experience necessary. Seniors/Juniors – Richard Bland College will be here today from 10:00 â 11:00am. Please have a copy of your transcript, SAT/ACT scores, and one letter of recommendation for on-site admissions. Attention all Lit Mag members and students interested in joining we will be meeting today at 2:30 in room 102 to select work and fonts for the 2015 edition of Imprint. Attention Seniors today there will be an informational meeting for the Senior One Act after school in the Black Box Theatre in room 623. This meeting is open to all Seniors that are interested in being part of the Senior One Act. We will have a brief meeting and vote for your Senior director, you must be present to vote. No experience necessary. Attention 11th grade students – the SOL Writing test will be given next week. The multiple choice section will be on Monday, March 30th and the writing prompt section will be on Wednesday, April 1st. You MUST take both parts to earn a score. See your teacher for your specific testing times. Attention all Lit Mag members and students interested in joining – next week Lit Mag will be meeting Monday March 30th, Tuesday March 31st and Wednesday April 1st at 2:30 in room 102 to select work and create spreads for the 2015 edition of Imprint. Attention Lafayette students we will be having a dodge ball tournament on Wednesday, April 1st at 5pm in the gym. Each team needs 6 players and each team must have one girl. Sign-ups are at all three lunches this week. The cost is $18 per team and $3 per person to spectate. All proceeds will go to help fund this years Prom. Students interested in a career in Automotive/Transportation. Wyotech will be at Lafayette on Thursday, April 2nd from 10:00 â 11:00am. Students interested please sign up in the green book located on the door of room 622. Seniors interested or planning to attend Thomas Nelson – Thomas Nelson’s open house will be held on Thursday, April 9th at the Historic Triangle from 1:00 â 4:00pm. Please visit LHS homepage or TNCC.edu to register. After-School SOL tutoring for the Writing SOL test will be held at 2:25 in room 311 every Tuesday and Thursday. Please see Mrs. Colorado in room 600 if you have any questions. Attention students – come to the library during AEP today for the Williamsburg Regional Library’s digital road show. Discover how to download free music, e-Magazines and e-Books. The first 30 students will receive a free pair of earbuds. If you are interested, you must get an AEP pass from the library. Attention Seniors Friday, March 27th there will be an informational meeting for the Senior One Act after school in the Black Box Theatre in room 623. This meeting is open to all Seniors that are interested in being part of the Senior One Act. No experience necessary. Attention all Lit Mag members and students interested in joining – we will be meeting on Friday, March 27th at 2:30 in room 102 to select work and fonts for the 2015 edition of Imprint. Attention Lafayette students we will be having a dodge ball tournament on Wednesday, April 1st at 5:00pm in the gym. Each team needs 6 players and each team must have one girl. Sign-ups are at all three lunches this week. The cost is $18 per team and $3 per person to spectate. All proceeds will go to help fund this years Prom. Attention Freshman Thursday, March 26th there will be an informational meeting for the Freshman One Act after school in the Black Box Theatre in room 623. This meeting is open to all Freshman that are interested in being part of the next school play. No experience necessary. The History on Film Club presents Apocalypto today at 2:30 in the Lecture Hall. Attention all Lit Mag members and students interested in joining – we will be meeting today and on Friday, March 27th at 2:30 in room 102 to select work and fonts for the 2015 edition of Imprint. Attention Sophomores Wednesday, March 25th there will be an informational meeting for the Sophomore Class One Act. Come to this important informational meeting immediately after school in the Black Box Theatre in room 623. Attention students – come to the library during AEP on Thursday, March 26th for the Williamsburg Regional Library’s digital road show. Discover how to download free music, e-Magazines and e-Books. The first 30 students will receive a free pair of earbuds. If you are interested, you must get an AEP pass from the library. Workforce Development and Continuing Education along with the Youth Career CafÃ© will be here Tuesday, March 31st from 10:00 â 11:00am to present career workforce and continuing education opportunities. Juniors are welcome to attend. To sign up or for more information, please see Ms. Adkins, Career Coach in room 622. Students interested in a career in Automotive/Transportation. Wyotech will be here on Thursday, April 2nd from 10:00 â 11:00am. To sign up or for more information, please see Ms. Adkins, Career Coach in room 622. Attention all Lit Mag members and students interested in joining – we will be meeting today at 2:30 in room 102 to select work and fonts for the 2015 edition of Imprint. The History on Film Club presents Apocalypto Wednesday, March 25th at 2:30 in the Lecture Hall. ASVAB Results – students who took the ASVAB on February 24th the results and interpretation will be given on Wednesday, March 25th in lab 202 at 8:30 a.m. Please report to 1st block and then to lab 202 at 8:30 a.m. Passes will be issued. Attention students – come to the library during AEP on Thursday, March 26th for the Williamsburg Regional Library’s digital road show. Discover how to download free music, e-Magazines and e-Books. If you are interested you must get an AEP pass from the library. Attention 11th grade students – the SOL Writing test will be given next week. The multiple choice section will be on Monday, March 30th and the writing prompt section will be on Wednesday, April 1st. You MUST take both parts to earn a score. Please plan accordingly to attend both parts of the Grade 11 SOL Writing Test. See your teacher for your specific testing times. Attention Lafayette – students we will be having a dodge ball tournament on Wednesday, April 1st at 5:00pm in the gym. Each team needs 6 players and each team must have one girl. Sign-ups are at all three lunches this week. The cost is $18 per team and $3 per person to spectate. All proceeds will go to help fund this years Prom! Attention Sophomores – Wednesday, March 25th there will be an informational meeting for the Sophomore Class One Act. This is a competition where all classes present their One Act play. If you are a Sophomore we need you to come to this important informational meeting immediately after school in the Black Box Theatre in room 623. No experience necessary. Refreshments will be served. Attention Freshman â Thursday, March 26th the LHS Theatre Department is having an informational meeting for the Freshman One Act after school in the Black Box Theatre in room 623. This meeting is open to all Freshman that are interested in being part of the next school play. No experience necessary! Attention Students: The library will be closing at 2:30 today. Attention Seniors â Class of 2015 shirt order forms will be available in the upper commons during lunches today. Order forms & money are due by Tuesday, March 24th and should be turned in to any SGA member or Mr. Jefferson. Seniors/Juniors – Richard Bland College will be here on Friday, April 27th from 10:00 â 11:00am. Please have a copy of your transcript, SAT/ACT scores, and one letter of recommendation for on-site admissions. To sign up or for more information, please see Ms. Adkins, Career Coach in room 622. Students interested in a career in Automotive/Transportation. Wyotech will be at Lafayette on Thursday, April 2nd from 10:00 â 11:00am. To sign up or for more information, please see Ms. Adkins, Career Coach in room 622. Attention all Lit Mag members and students interested in joining – we will be meeting on Tuesday, March 24th, Wednesday March 25th, and Friday March 27th at 2:30 in room 102 to select work and fonts for the 2015 edition of Imprint. Attention Lafayette students we will be having a dodge ball tournament on Wednesday, April 1st at 5pm in the gym. They are teams of 6 and each team must have one girl. Sign-ups are at all three lunches this week. The cost is $18 per team and $3 per person to spectate. All proceeds will go to help fund this years Prom! 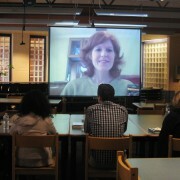 Joelle Charbonneau, the author of the Testing trilogy, skyped with LHS students in the media center. Students were able to ask questions about her books and the creative writing process. The AEP Chorus will not meet today. Are you a Junior or Senior that likes to draw? The LHS PTSA is holding a t-shirt design contest for this year’s After Prom event. The theme is âTimes Squareâ (as in New York) and the winner will receive two tickets and two t-shirts to After Prom. Your entries must be submitted today to the front office. Winners will be announced on Monday, March 23rd. ASVAB Results – students who took the ASVAB on February 24th the results and interpretation will be given on Tuesday, March 25th in lab 202 at 8:30 a.m. Please report to 1st block and then to lab 202 at 8:30 a.m. Passes will be issued. Come and meet those dancing feet – don’t miss our spring musical 42nd Street. Show dates are Friday, March 20th and Saturday, March 21st. Tickets are $10 each and will be on sale during all lunches this week, all seats are reserved. This show is going to be a great one and you don’t want to miss the actors, dancers, singers and musicians performing 42nd Street. Show times Friday @ 7PM and two shows on Saturday @ 2pm and 7pm. Seniors/Juniors – The Scholarship, Essay and Application assistance session will take place today from 9:30 â 10:30am in the Media Center. Anyone who needs help with filling out scholarship forms, revising essays, and general questions. Please sign up with Ms. Adkins, Career Coach in room 622. The green book is located on the door. Sentara Summer Junior Volunteer Program – Applications are currently available in the Counseling Department. Please complete and submit the application to Sentara by Friday, May 11th. For assistance, please attend the application session Friday, March 20th. For questions, please see Ms. Adkins or your counselor. Don’t forget to donate items to the Heritage Humane Society. Drop off your donations first thing in the morning in the Upper Commons. Attention Seniors â Class of 2015 shirt order forms will be available in the upper commons during lunches today through Monday, March 23rd. Order forms & money are due by Tuesday, March 24th and should be turned in to any SGA member or Mr. Jefferson.